The privatisation of our public services and common wealth is taking place with stealth and subterfuge, and at a great pace. Our money is going to multi-nationals such as SERCO, currently under investigation for falsification of data and sub-standard services. But there are ways to expose what is going on and get it into the public domain. 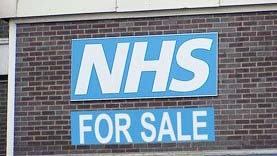 Marion Macalpine has created a photographic exhibition, How come we didn’t know, on the accelerating privatisation of our NHS, the companies involved and the consequences of us all of this shameful sell-off. If you want to show it in your area, contact Marion who is based in Hackney, London. marion.macalpine@blueyonder.co.uk. This entry was posted in evidence and views from elsewhere, Stories and tagged campaign, NHS, privatisation by Penny Waterhouse. Bookmark the permalink.